Looking for the best laminators? Laminators have become a valuable tool for teachers, office organization, and even for home use. It’s quite satisfying being able to make a smudge proof, coffee proof documents in minutes or less. For teachers, laminators offer the best opportunity to make creative and durable projects, reusable worksheets, as well as quick dry erase boards. At home, a laminator can be used for making the best recipe cards that can easily be cleaned after use. Students can make the best personal, durable flashcards that can go anywhere without worries about tears, crinkles, and coffee stains. A thermal laminator that is compact and portable with the technology to laminate documents can really come pretty handy for most people. For casual use, at home or at school, a less expensive laminator but best will often get the job done. However, for busy teachers or in a larger workplace, a heavy duty and more expensive best laminator will often be the best choice. The two main types of best laminators available are pouch laminator and roll laminator. We focus on pouch laminators in our review, however, roll laminators are a great option for large businesses and institutions. Pouch laminators are great for home use, teachers, and small – medium-sized offices. They allow for lamination of documents until 14 inches. They use plastic pouches, or laminating pouches. You simply place your documents in the pouch, then a protective carrier is used for feeding the pouch through the machine. Protective carriers provide rigidity and prevent the machine from jamming. However, not all pouch laminators require you on using a protective carrier. Laminating pouches come in various designs, which can be helpful for making a variety of documents. Slotted pouches are great for ID tags and luggage tags. Matte writable pouches provide a frosted finish making them great for DIY dry erase boards. Cold pouches are great if you only want laminating a few documents since they do not require a laminating machine. There are also sticky backed, colored and decorative pouches. Laminating pouches also come in various sizes, from small credit card sized pouches until large 12×17 menu sized pouches. Roll laminators are often larger machines and are great for larger documents. They use rolls of laminating film and are excellent for very large posters. If you’re planning on making only a few posters, it’ll be more economical going to your local print shop, as these can be quite expensive. Thermal laminator work by heating the adhesive on the laminating pouch as it passes through the machine. Documents made using thermal laminator tend over being more durable. Some thermal laminator allowing you also laminate your documents using pressure only, in other words, they have a cold laminating feature. Cold or pressure laminators work by using pressure to seal the laminating pouch. Cold laminators are best used for sensitive documents such as photos. Self adhesive laminating sheets can be used ti cold laminate a documents and do not require you using a laminating machine. However, you may choose over on getting a laminator to achieve better quality lamination. Laminating thickness determines how durable your documents will be. A thicker laminating pouch is recommended for documents that will be frequently handled such as a flashcard or recipe card. Whereas, a thinner pouch may be sufficient for lightly handled documents such as certificates. Not all laminators are able over handling all pouch thicknesses. Laminating pouches are available in 3 mils – 10 mil thicknesses. 1 mil is equivalent to one-thousandth of an inch, therefore, you can create laminated documents from 0.003” – 0.01.” A very thick, 10 mils laminating pouch will give you a stiff documents that can stand up on its own, this may be ideal for display photos and signs. A thinner, 3-mil laminating pouch will be ideal for documents stored in a binder or folder where saving space is a consideration. A 5 mil laminating pouch is often adequate for business cards. You may need buying a few different pouches before deciding which is best for your project. Depending on what projects you wish to use your laminator for, documents size will be an important factor over considering. Most best laminators can handle small – medium sized documents such as recipe cards, business cards, and letter size papers. However, for larger documents, a laminator machine with a large entry width will be required. Laminators that use pouches are available in various widths, from 4 inches – 14 inches. For very large documents and posters, a professional laminator may be necessary. Very large 80 inches wide format laminators are available for commercial use. Speed will be a critical factor if you planning over laminate larger quantities. With thermal laminator, the time it takes the machine to heat up will determine how quickly you can get a project done. Cold laminators don’t need to warm up, but may not be ideal for every project. The laminating speed of the machine is also important. If you need to get your documents laminated quickly, look for a laminator that heats up and runs through the document quickly. The number of rollers in a laminator help determine the quality of the documents produced. Most machines come with two rollers which work to press the two ends of the pouch together creating a seal. Some machines have a second pair of rollers that remove wrinkles allowing for a smooth finish. 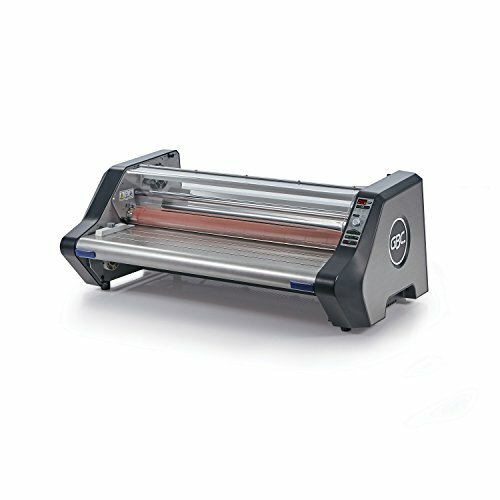 The ideal laminator is one that is quiet, appeals over your aesthetics, and takes up little space on your work surface. The Scotch Thermal laminator (TL901SC) is one of the best laminator for small to medium size documents that do not require heavy duty protection. This top laminator comes in a sleek, portable design and has hidden cord storage making it easy to store. It has an indicator light to let you know when it has warmed up and is ready to use. This thermal laminator also has an auto shutoff safety feature. This thermal laminator is able to handle documents til 9 inches wide, and pouches from 3 mils – 5 mil thickness. It has 2 settings, 3 mil thickness, and 5 mil thickness. It comes with only 2 rollers, so it does not have additional rollers to remove wrinkles, but their lack may not affect projects using thinner pouches. It’s not the fastest thermal laminator out there but may be best enough for your needs. It takes 5 – 7 minutes to warm up. It’s a relatively inexpensive option for those just starting to laminate. It’s available for around $30 and often comes in a bundle with a few pouches. You may be able to find it on sale from time to time. 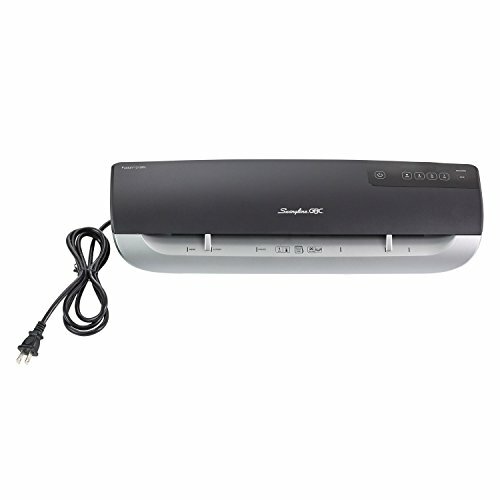 It’s also a common thermal laminator, available in various stores including Walmart. It has positive reviews on Amazon. This an inexpensive thermal laminator with nice features. This thermal laminator works best for small – medium sized documents and can handle documents until 9 inches wide. It’s compatible with laminating pouches until 0.02 inches, however, it’s ideally used with 3 mil and 5 mil pouches. It has a sleek design and is a newer model, released in 2017. It may not be the best choice if you are in a hurry since it takes 3 – 5 minutes to heat up. However, it does come with an indicator light letting you know when it’s ready to use. It also has an led light letting you know the power left. To help with paper jams, it comes with a jam release designed allowing you to manually remove jammed papers. A nice feature that helps this thermal laminator stand out is the cold option which lets you laminate without heat. This is great for sensitive documents like photos. This a best, inexpensive option for home and small office use. It also comes with a pack of laminating pouches for first-time use. While this is a great laminator for light use, it isn’t the choice for heavy duty work. It isn’t meant for using uninterrupted for 3 hours or more and can not hand very wide documents and thicker pouches. Amazon released its own Amazonbasics thermal laminator in 2017, and it’s another affordable option for small office and home use. It stands out from similarly priced thermal laminator with the ability to laminate slightly larger documents. This laminator can handle documents til 13 inches, making it more versatile than the competitors. 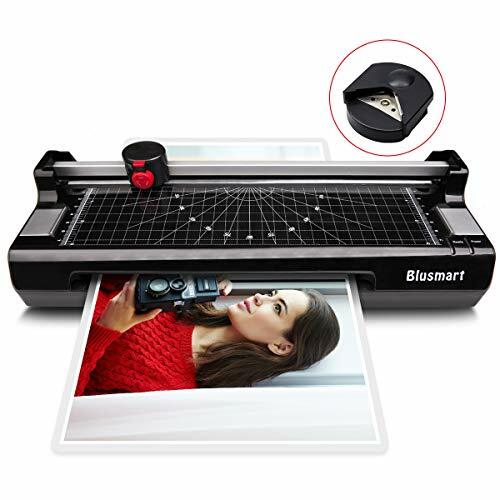 Customer reviews indicate that the amazonbasics thermal laminator can be used for foiling gold lettering if it is thick rich black areas, making it even more useful for crafters. While great for most projects, it does not have a cold function and takes a bit longer to heat up. It also can not handle thicker pouches. The nice sleek design and affordable price may make it a winner for most beginners. Amazon also has a 9” thermal laminator is probably the most cost-effective option. If you are willing over paying a little more, this best laminator is a great value for the functionality. It has all the features of the entry model laminators and it also comes with a built-in paper trimmer and corner rounder. The warm-up speed is similar to that of the inexpensive laminators, with 3 – 5 minutes to warm up. It does, however, have the additional cold laminating feature, making it useful for heat sensitive documents like photos. It’s said to produce less noise. The paper trimmer has 3 different cutting patterns: straight, perforated and wave. It can cut til 3 sheets at once. The maximum width it can handle is 310 mm. The machine also has a removable corner rounder, allowing you to add a professional finish for your projects. The GBC Thermal Roll Laminator is one of the best laminator on the market. This is a roll thermal laminator which is great for larger projects. It can laminate documents til 27” wide. It has an EZload feature, simplifying loading of the roll of thermal laminator film. It warms up in 6-9 minutes and can handle film up to 3 mils thick. Despite the slow warming time, once started it laminates documents quickly with a speed of til 12 feet per minute, thereby allowing you to complete bulky tasks within a short period of time. The GBC roll thermal laminator comes with the usual convenience features including auto standby and auto shut off as well as an indicator light to let you know when it has heated up. This is a heavy duty thermal laminator that works well for larger offices, schools or businesses and for those who need to laminate large documents frequently. Like many other larger thermal laminator, it is quite heavy (116 pounds) and not portable. This laminator machine is more expensive than the smaller, portable thermal laminator. However, it is more functional and worth the investment for those requiring a heavy duty thermal laminator. It uses thermal laminator film which is often less expensive than lamination pouches, especially when used for larger more complex projects. If you are looking for purchasing a top quality and high-performance best laminator for a budget-friendly cost, then you should consider looking at this product. 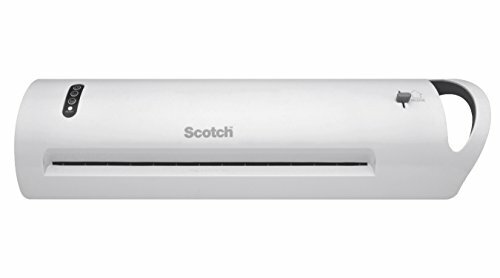 The Scotch Advanced Thermal Laminator is a popular and top-rated product on the market. It stands out from the competition with its quick warm-up time which may be useful for allowing an instant use of the product. This feature also makes it possible to complete large tasks within a short period of time. 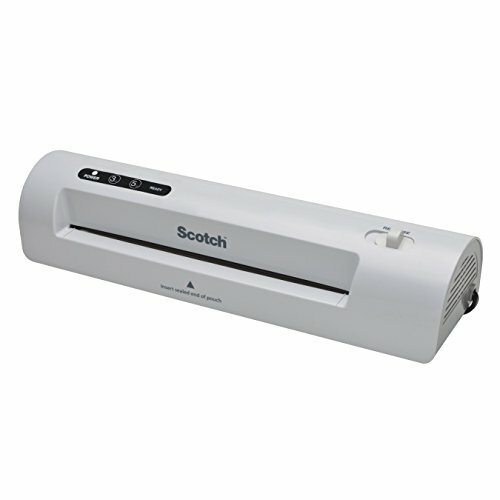 Also, the Scotch Advanced Thermal Laminator has the ability of handling documents of 13 inches thereby allowing it to easily laminate large pieces.This product like many other portable thermal laminator, it comes with a few convenience features including cord storage, auto shut-off, and a carry handle. Besides heating up in only 1 minute it also laminates documents relatively quickly at 11.8 inches/min (300 mm/min). Like many other portable thermal laminator, it works with 3 mil and 5 mil pouches and has 2 rollers. If you need a portable thermal laminator that works quickly this may be the best option for you. However, some users complain that the product is a little bit more expensive compared to similar products on the market. 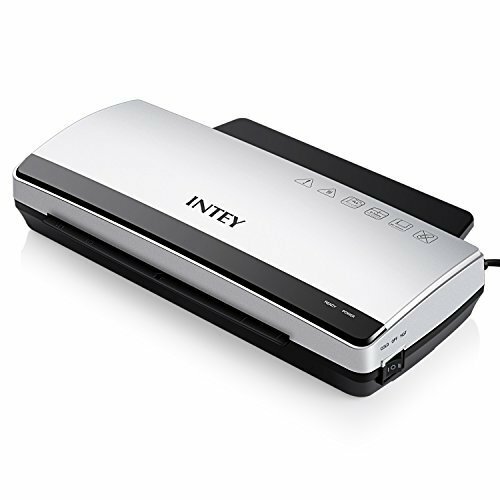 This is another best thermal laminator that works quickly and is great for those in a hurry. The Fellowes thermal laminator Saturn3i 125 warms up in 1 minute and works relatively fast. This is one of the features that allow the product to stand out among that of competitors as will allow you to complete lots of lamination work within a short period of time. One may safely conclude that the product goes a long way to save time, energy and power. Furthermore, the Fellowes Laminator Saturn3i 125 works with 3 mil and 5 mil pouches and has 2 rollers. It can accommodate documents up to 12.5 inches wide. It also comes with a cold function, allowing you to use it to laminate heat-sensitive documents. It has the common convenience features including an indicator light and auto shut off. It also comes with a release lever, so that papers can be re-centered or removed. Many users like it that the product offers a good value for money. The Swingline GBC Thermal Laminator is the last best product on our list but far from being the one with the least amazing features. It is a high-performance product that features a modern and beautiful design. This is the best thermal laminator for using with thicker pouches as it can handle up to 10 mil pouches. Thereby allowing to easily laminate large pieces within a short period of time. It accommodates until 12 inches wide documents. Also, it heats up quickly, within about 1 minute, and it has a fast laminating speed of until 39 inches per minute. This will go a long way to help you complete bulks of work more efficiently within a short time frame. The Swingline GBC Thermal Laminator is a great option for those interested in crafts, making laminated covers and more durable signs and flashcards. The product is inexpensive compared over similar ones on the market.